Discussion in 'Playstation - PS4 & Vita' started by Se777eN, Feb 21, 2013. This was posted on there facebook page and was captured on the ps4 looks stunning and alot better than the other vids on YT..
really the Ps4, or even a dev kit (are they final yet?) or just a similar pc as some of the others where? On a similar pc supposedly mate. hard to truly say, It seems a Dev kit as he used the share function button to upload it to the facebook page to show that it works, I was watching the Giant bomb stream and they checked facebook when the guy said it was uploaded to see if it did and it was there. now you cant 100% say for sure if that really worked or that guerilla didn't just upload a already done piece of footage to facebook to make it look like the share function worked but i'm going to give them the benefit of the doubt for now. This might of been played on the ps4 but watch dog was on pc running a close ps4 spec..
PlayStation 4 Demo of Killzone: Shadow Fall - YouTube! Just watched that earlier was on jimmy fallon i think its called, looked great but then again killzone has always looked great. Devs may have had 8GB before Sony chose to make it final so they could have utilised it for the build hard to really know without knowing how old the build is. I dont know what res they were running the game at it could have been 1080p 60hz in which case i would think the PS3 would have struggled not just because of the graphics but the Physics fx and lighting etc involved. I think that's what you will see much more of with PS4 maybe not super out of this world graphics above the PS3 although there is bound to be games that do, but mostly Physics and FX etc at Frame rates and resolutions that the PS3 would struggle to cope with. I read on the Neogaf forums it's running at 1080p at 30fps. They need to get this up in the PSN so we can watch on our TV's! even at 1080P 30fps the PS3 wouldn't be able to do it previous killzones were at 720p due to PS3 limitations, so yeah there is still much going on at a higher res than the PS3 would be able to cope with. Yeah I'm sure unread the latest dev kit had 8gb in there. May have got crossed with the nextbox though. Read that many rumour links!!!! 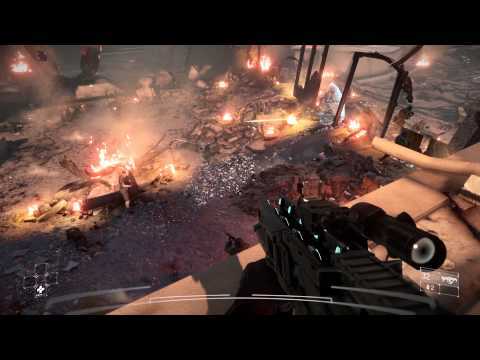 I remember the Killzone CGI Sony shown on the launch of PS3 and it turn out to be complete fake and this time they are showing gameplay but not on actual Playstion. Anyone else think there was a disproportionate number of bald male character models in that video lol a small thing, but you would of thought with the 'power of PS4' they could implement some variation. Where does this game fit within the Killzone story and previous games, have they released any info? Looks good, other games were half decent to play but awfully shoddy looking imo. This looks to be great tho after watching that. Would love to know too. Seems they are both living together there albeit via a great wall divide. Would love to know how its got to this point. I saw somewhere it said 5 or 20 (can't remember) years after the events of Kz3. Erm, you saying Kz2 and Kz3 looked shoddy? They had some of the best graphics from the current generation imo. I agree KZ3 was amazing ! So funny that it looks so colourful and beautiful and then after the explosion its back to the usual killzone grey/brown colours everywhere. Wouldn't hurt them to add a splash of colour even in warzones once in a while. Killzone 3 was very colourful! You had alien jungles and snow! (I always love snow levels.) shame they butchered multiplayer with "immune to radar, uav, invisible super soldier" classes. I don't think Radar should exist in games. It's not like you have it in wartime telling you where the enemy is. Unless your character wears a helmet that takes up a portion of your screen and wastes a perk slot with the eyepiece that folds over one eyes that shows the radar and obscures more of your view. And the only way that would logically work is if everyone on your team wears something that pings your signal saying they are friendly and all others are not. Honestly, would love to see like an audio signal on your screen when someone is firing an unsilenced gun showing you "roughly" what direction the sound came from. And the location being obscured by the sound echoing off walls and the like. Or you only get radar pings if you have a scout on your team pinging people similar to BF3 with the select button. Where their entire job is to ping people and they get a ghillie suit and some thermal binoculars. Love the music and intro at the start of that clip, the only thing I find disappointing is that it's Killzone, just never really got on with it, no strong characters to connect with for me and despite the graphical update its not really doing anything new, hiding behind non destructible cover should hopefully be a thing of the past going forward. Paper bags in the future are actually made of adamantium. KZ dev said this demo was using 1.5gb of VRAM. I always felt kz3 we poor. The graphics were all over the place made out difficult to see things clearly or to focus and the perks were way ott. I even posted here I think about changing my tv settings to improve the image so I could see better. There was too much color etc. I even checked it in case it had been set to colour blind settings! puuh, its okkkkkkkkkkkkkk but its ps3.5 at best. there might be a bit more depth, it might run in 1080p instead of 720p... so what? is anything so far truly screaming next gen? For me, saying it looks better than KZ3 is way off point. ps3 was released in 2005 / 6 dudes. Last time I looked, its 2013 and we will get it 2014. Wheres the big jump? Answer.... not here!